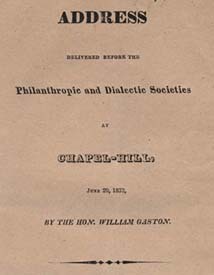 William Gaston, 1778-1844 Address Delivered Before the Philanthropic and Dialectic Societies at Chapel-Hill, June 20, 1832. Address Delivered Before the Philanthropic and Dialectic Societies at Chapel-Hill, June 20, 1832. Raleigh: Jos. Gales & Son, 1832. Slavery -- Moral and ethical aspects -- Southern States. Speeches, addresses, etc., American -- North Carolina -- Chapel Hill.